The sun sets at Kaka’ako Park in downtown Honolulu. 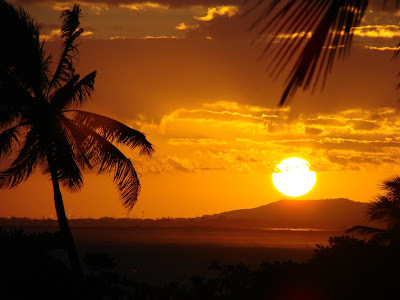 This is one of my favorite places to snap photos and the sunset represents the ending of 2010. It is hard to believe another year has gone by so quickly. I’d like to wish you all a Happy New Years Eve. Way back on January 1, 2008 Global Hawaii Blog started this photo of the day feature and I am proud to say tomorrow will mark the start of year 4 of the photo of the day. Here is a flashback to the photo that started it all. Goodbye Sun, Goodbye 2010, Goodbye loyal readers.. see you all in 2011. 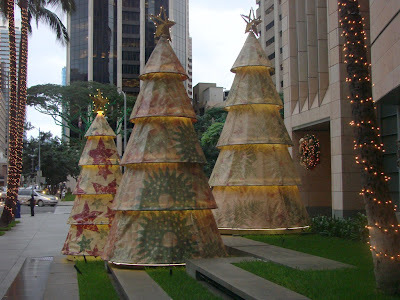 Here is the Christmas Tree display outside of the First Hawaiian Bank building in downtown Honolulu. There are multiple sets of these huge trees and the even light up at night so if you are in the town area be sure to drive or walk by these trees. It’s so hard to believe the year is almost over. I’m looking forward to the new year 2011. 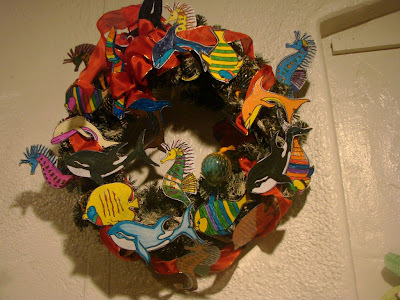 Here is a beautifully decorated wreath entitled “Holiday Under the Sea” created by the exte3nded day 2nd grade class at Le Jardin Academy. This colorfully depicts many of the fish found in Hawaii. Don’t forget the Honolulu City Lights display and Honolulu Hale where these can be seen ends on January 2nd so head on over before it is too late.